The Orient House has been the center of Palestinian diplomatic activity since the turn of the century. The following is a list of notable visitors to the Orient House. Emperor Haile Selassie of Ethiopia and Empress Minan of Abyssinia also found the Orient House a haven for their court when the Italians invaded their country and forced them into exile. King Abdallah, King Ali and Prince Zaid accepted condolences at the Orient House when their father, Sharif Hussein Ben Ali (Sharif of Mecca), was buried in the Haram al-Sharif. Click to see pictures of King Abdullah's visit. 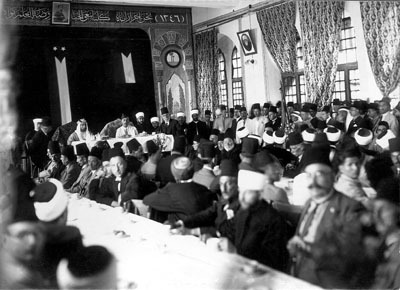 German Emperor, Kaiser Wilhelm, visited the Orient House in order to attend a tea party, hosted by Palestinian notables to commemorate his visit to the city of Jerusalem. Prince Abdullah visits the Orient House with Jerusalem Mayor Musa Khazem Al-HUsseini, 1930. A meeting of Palestinian nobility at the Orient House, 1930s.